The AED Defibrillator training course is a half day course for those who wish to learn about and use an Automated External Defibrillator (AED). 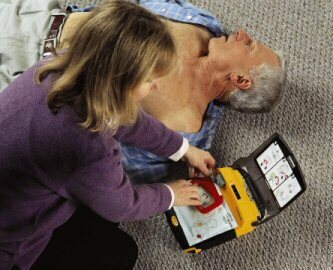 Areas covered include the safety precautions in using the AED, when and how to apply pads, when to defibrillate, the use of defibrillation and CPR, and the use of a Bag and Mask resuscitator. Those attending for training should preferably hold a current first aid certificate. An attendance certificate is issued which is valid for 12 months.